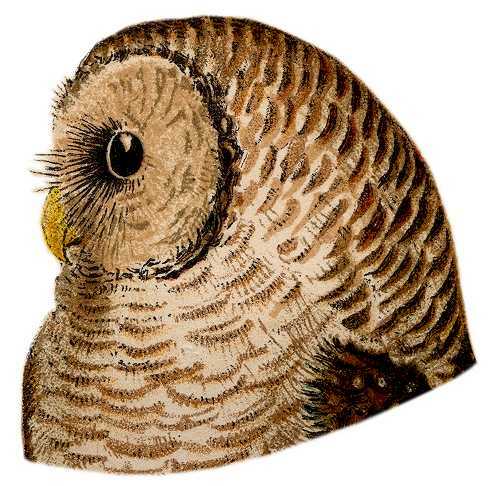 This barred owl house is constructed with cedar, pine or most any softwood. Use wood stock rough-cut on both sides so birds can grip interior and exterior surfaces. It has a 12″ by 12″ floor (inside dimensions) and is 22″ floor to ceiling (inside front). A 7″ by 7″ entrance hole (with straight cut bottom and sides and arched top) is located 18″ above the floor (to top of hole). Ventilation openings are in the floor and under the roof. Installing and maintaining boxes at heights can be dangerous. Anything that makes a chore less awkward increases safety. A hinged roof can be secured in closed position with shutter hooks. Or a fixed roof and Side Opening Doors may be a preferable, more convenient, and a safer alternative. If full width wood stock is not available, use two 1″x 6″, or 1″x 8″ cedar, pine or other softwood boards. They usually vary from 5 1/4″ to 5 1/2″ wide and 7 1/4″ to 7 1/2″ wide. Cut them to width and secure well. Reinforce with chamfer strips (inside) or batten strips (inside or outside) fastened perpendicular to vertical panels. Always use corrosion resistant screws and hardware. Drill countersunk pilot holes in primary and regular pilot holes in secondary work pieces. This reduces a tendency for wood to split. It makes for easy assembly in minutes with a power or hand held screwdriver. The back wall panel extends beyond both top and bottom. Drill pilot holes in these panels. Mount usually to a tree or post. Drill an extra mounting hole inside the box just under the roof. Stagger these holes so that all are not in line along a single wood grain. Holes in line with grain can weaken and cause wood to split. Mount nest boxes for Barred Owls 15 to 30 feet high. Locate in forested bottomlands (not in clearings), or near flooded river valleys and swamps. Place some wood chips (not sawdust) on the floor. Birdhouses out of reach and further should be installed and maintained by professionals. Carpenters, electricians, line workers, etc. have the right equipment and experience. Remove the nest from the box in late summer or fall well after the brood rearing season is past. Or clean and leave it installed. It might be used as a winter roost. Various owls, squirrels, and raccoons may use this nest box. If 12″ x 3/4″ (or x 1″) boards are not available, use 1″x 6″, or 1″x 8″ boards (or similar) made of cedar, pine or other softwood cut to width. More accurately these boards measure approximately 5/8″ to 3/4″ thick and 5 1/4″ to 5 1/2″ wide and 7 1/4″ to 7 1/2″ wide. When doing so secure well in place. Reinforce with chamfer strips (inside) or batten strips (inside or outside) fastened perpendicular to vertical panels.